Build Your Hospital Or Clinic Fast! Looking for healthcare construction contractors? Searching for a reliable healthcare facility construction company? Want to build a clinic or hospital anywhere in Nigeria? Look no further. You have come to the right place. 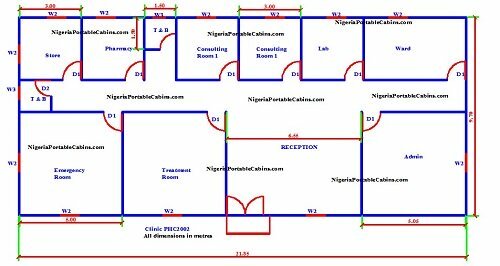 We are a prefab building construction company that deliver high quality health centres, hospitals, clinics and healthcare facilities wherever they are needed in Nigeria. We build . . .
What makes our building construction services different? We deliver what matters most to our customers . . . high quality buildings delivered speedily, on time and in full. Yes, we are a company you can trust! You know that "health is wealth". Since that is true, every community in Nigeria . . . every town, village, and city in Nigeria . . . deserve to have as many health centres (or healthcare centres) as possible. It is true that many communities currently have some form of healthcare facility. However, many people living in those communities can attest to the fact that the number of facilities available is far below what is required. Yes, there is a huge gap still to be filled! What is one of the biggest healthcare facility construction challenge that governments and private investors have to face? It is the time it takes to complete a functional health centre. There are times you hear in the news of a new health centre under development and the inhabitants of the community are happy to receive the news. 6 months after, the healthcare centre is yet to be completed. How many lives do you imagine may have been lost between when the health centre construction started and when it is completed? Even if it's just ten lives, how many can healthcare providers replace after they have been lost? We need more health centres. And we need them now! The good news is . . . now we have healthcare construction techniques that work like magic. Our prefab healthcare facility construction service can deliver health centres in just days . . . or a few weeks . . . depending on the size of the healthcare centre. It's because we use prefabricated sandwich panels for our building construction. And all the prefab building materials do not require "drying time" and "waiting time" like sand, cement, and concrete buildings do. We simply move men, materials, and equipment to the construction site wherever it is in Nigeria (even in the remotest of villages) and the healthcare construction work starts immediately. Want us to collapse the construction time even further? All we need do is put more men on the job and the building construction gets done even faster than fast. Since we cannot resurrect any dead Nigerian, the least we can do is create more health centres . . . and super fast! . . . to ensure we don't lose those lives in the first place. If you will like to save the lives of many innocent Nigerians, we implore you to invest in health centres, hospitals and clinics across the country . . . in bustling cities and rural communities. We will construct the health centres, hospitals or clinics fast using the latest prefab technology available to us. And you can fund the project and help dry the tears of many weeping families whether you're a wealthy individual or the responsible government agency. If yes, please fill the form below to request a quote.